Ano Nuevo is a beautiful state park along the Highway 1, nestled along the California coast north of Santa Cruz and south of Half Moon Bay. Late winter is especially the best time to visit Ano Nuevo’s elephant seal colony, when they’re ashore for one of nature’s biggest soap operas: mating and breeding. Ano Nuevo State Park was the perfect place to take my mom on a quick San Francisco getaway! During breeding season (December 15 – March 31), visitors are allowed access to the natural reserve only through 2.5-hour guided walks. The President’s Day weekend slots were all filled up when I decided to take this trip, but my mom and I were able to show up bright and early to the park and put our names on the waitlist. The park staff does their best to accommodate everybody on the waitlist and squeeze people onto tours, but planning ahead is always best since it’s not guaranteed that all the waitlisted visitors get to go on a tour. Our volunteer tour guide was extremely knowledgeable and passionate about the park and the elephant seals. 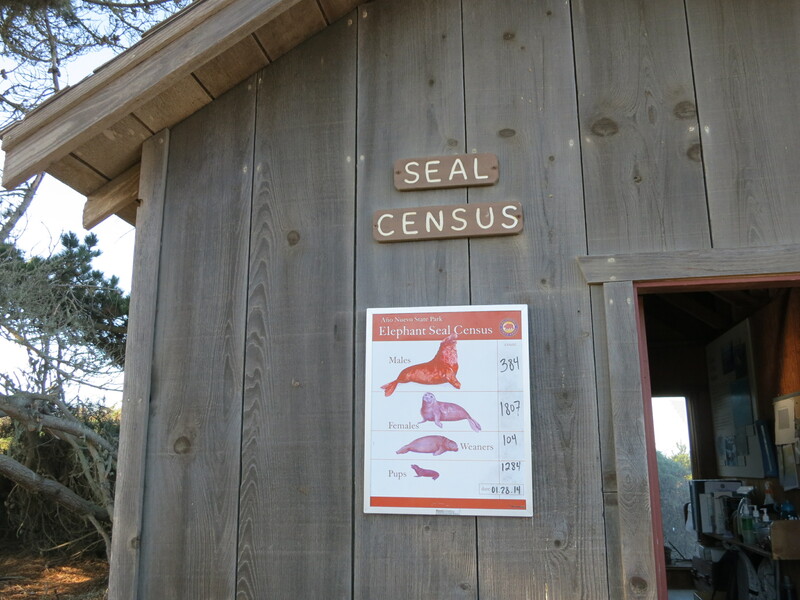 Not only did my mom and I learn about the elephant seal lifecycle, diet, and mating habits, but we also found out about the unique geological history of Ano Nuevo. The highlight of the tour was definitely walking close to the elephant seal colonies, aww-ing at the plump seal pups, and witnessing the alpha-male-beta-male power struggle. By this point, we were starving after a morning full of walking and photo-taking. Pescadero, a tiny town just 20 minutes north of Ano Nuevo, was the obvious stop for lunch. We joined locals, daytrippers, and bikers at Arcangeli Grocery for freshly baked artichoke garlic bread, and bought some avocados and dry figs from the local market to complete our picnic. Bring a windbreaker, water bottle, good hiking or walking shoes, and sunscreen. The tour lasts 2.5 hours, and plan for more time if you’re on the waitlist. This entry was posted in Do, Explore, San Francisco and tagged Ano Nuevo, Arcangeli, Elephant Seals, family, holiday, monterey, nature, Pescadero, san francisco, travel.